When it comes to upgrading their adventure, your clients have two ways to experience the best that Royal Caribbean® has to offer. 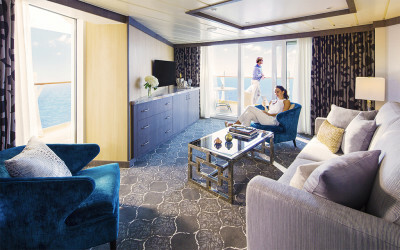 Whether they’re redefining memory making in one of our fleetwide suites, or indulging in luxury that’s anything but boring in Royal Suite Class, available exclusively on Oasis Class ships and select Quantum Class ships, they’re in for voyage unlike any other. This is Royal Suite Class – and it’s elevating every aspect of your vacation. Like a private cabana at our exclusive tropical destination of Labadee®, or a backstage tour at your favorite onboard Broadway show. And it can all be arranged by your very own Royal Genie, who crafts unique experiences like these just for you. All in the most expansive suites at sea, from a slice of paradise right outside your door to revolutionary multi-level Royal Loft Suites. Available exclusively on Oasis Class ships and select Quantum Class ships, they’re in for voyage unlike any other. This is the new definition of VIP. It isn’t priority access – it’s all access. And it starts with the most spacious and unbelievable suites at sea. Plus, a Royal Genie that takes your clients VIP status ship-wide. This is spectacular accommodations, attentive service and exclusive experiences. Your clients Royal Concierge crafts their personal adventures, from priority reservations to catching the day’s first wave on the FlowRider®. This is a place to rest and recharge between adventures. In these spacious suites, every detail has been carefully considered with your clients in mind. 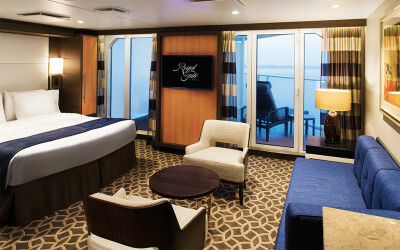 Royal Suite Class isn’t the only way your clients can enjoy the suite life at sea. From Vision class through freedom line all of our suites offer spacious accommodations, thoughtful amenities, special privileges, and personalized service that make your clients feel catered to by every member of the staff and crew, every step of their vacation — from the moment they arrive at the pier through departure day.